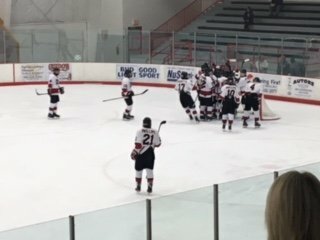 The Marquette Redmen Hockey team played their second game in as many nights as they beat the Chelsea Bulldogs 4-2 in the Chelsea Hockey Tournament. Inclement weather made it difficult for fans to show up, but passionate parents persevered. Games can be heard live online at foxsportsmarquette.com. Shot-prevention was the headline for Marquette, only allowing Chelsea two shots through the first fourteen minutes of the game. The Redmen played very similar to last night’s third period as they held Livonia-Churchill to just three shots while shooting fifteen of their own. Despite owning control of the puck for nearly all of the first period, Marquette was not able to score. Junior forward Joe Phillips had a good opportunity early in the game for the Redmen but was stoned by freshman goaltender Aidan Boote. Marquette found themselves down two goals midway through the second period. Junior forward Kobie Guidebeck fired a shot that missed the net but bounced to the stick of junior forward Tanner Phillips who had a great chance but couldn’t score. Guidebeck would redeem himself a few minutes later by blasting a slapshot past the glove of Boote, closing Marquette’s gap to one goal. Senior forward Hunter Doucette evened the score right before the end of the period by putting in a loose puck in front of the Bulldog net. Through two periods, the Redmen outshot Chelsea 23-8. Early penalties didn’t stop Marquette’s barrage of shots in the third period. After taking a penalty while on a power play of their own, Guidebeck joined the offensive rush a fired a wrist shot over the outstretched arm of Boote for his second goal of the night. Phillips capitalized for Marquette with 3:11 left in regulation, also collecting his second goal of the game, to add a bit of insurance. The Redmen held the Bulldogs without a shot in the third period. The Marquette Redmen hit the ice once again tomorrow against Davison High School at 9:15 a.m. with pregame coverage beginning at 8:45 a.m. Audio coverage can be heard live on 105.1-99.9 fm Fox Sports Marquette and streaming online at foxsportsmarquette.com. Stream from tonight’s hockey action here.